CCTV Camera Pros recently helped Kaplan University in Pasedena, California select a video surveillance system with audio for a monitoring / training room for medical students. The university had the following requirements for the system. Record audio and video from their six medical training rooms to a central location (monitoring room). Display live video of each room on a dedicated monitor in the monitoring room. Use an additional monitor to display multi-camera views. 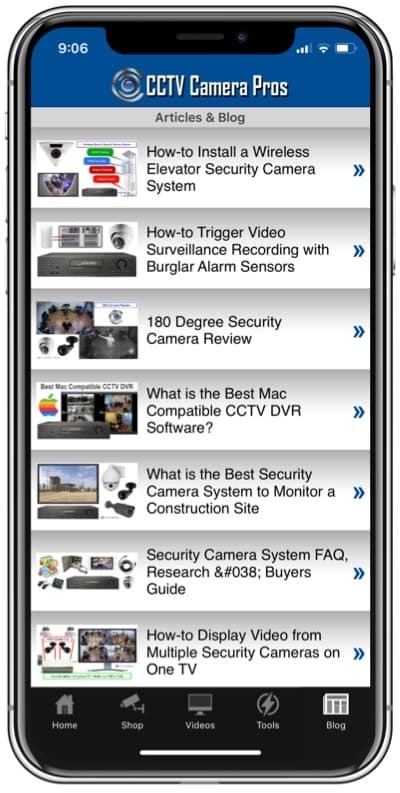 Be able to login to the system over their network to view cameras and hear audio. The customer not only wanted live audio from the speakers of the dedicated monitors and audio recording, but, also have the ability to plug into a given audio channel with headphones. This picture shows the monitoring room after the installation was done. Here is a diagram of the installation. Each room has a PRO-680DN28 box-style CCTV camera installed to the ceiling in the corner of the room. The 2.8mm lens of this camera provides a wide angle of view. So, a single camera can monitor small rooms with no blind spot. A MIC-CCTV-02 stand along surveillance microphone was installed on the ceiling tile near the camera in each room. A 18 channel 12v DC central power supply box was used to powerall cameras and microphones. Pre-made Siamese cables were used to run the video and power for all cameras. 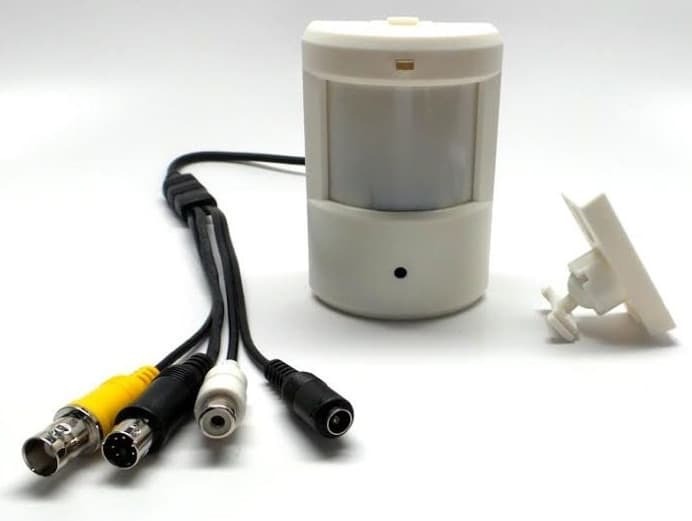 The cameras were connected to the input of a 8 to 16 channel CCTV video splitter so that the video could be shared by the dedicated monitors and the DVR. BNC jumper cables were used to connect the outputs of the video splitter to the monitors and DVR. Pre-made cables were also use to run the audio and power for all microphones. Because the mics use RCA connectors, we also used a BNC to RCA converter / connector. This is the 19 inch BNC monitor that was used for the dedicated display from each camera. 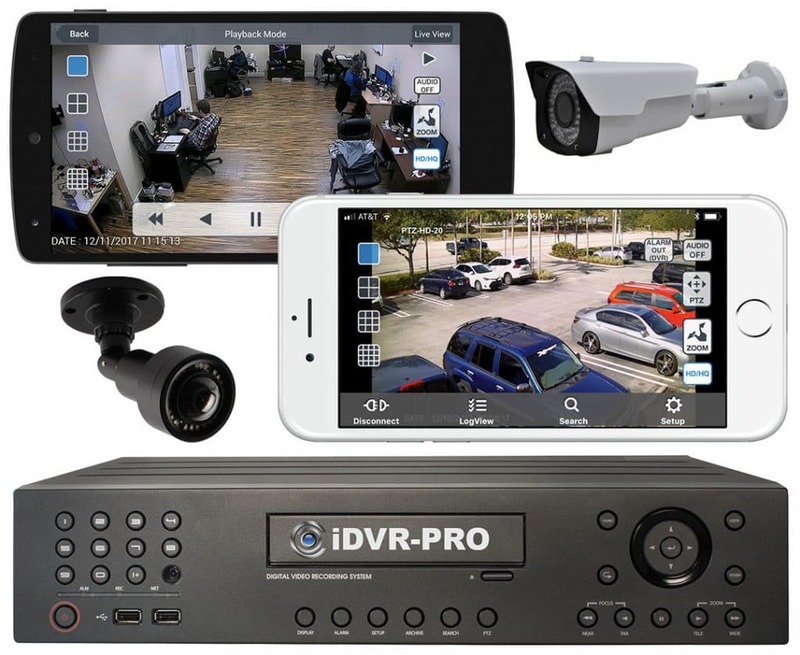 An iDVR-PRO8H CCTV DVR was used to record the video. The university instructors can search an playback audio and video directly on the DVR using a mouse to control the interface. The instructors can also install Windows and Mac software on their PCs to login to the DVR over the network. 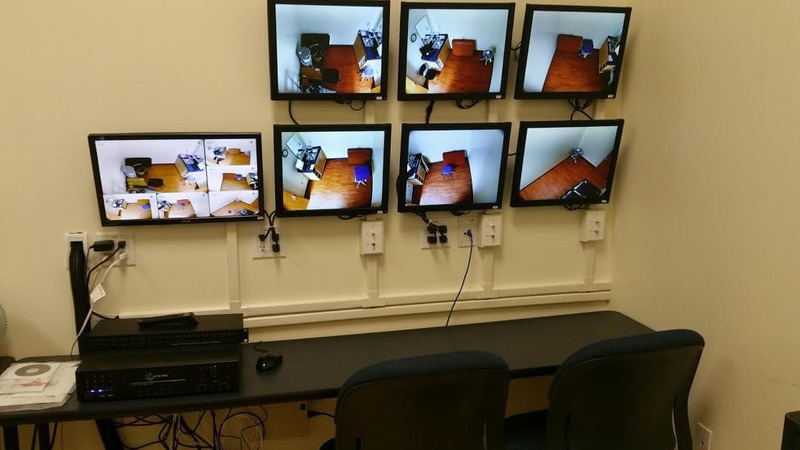 A VGA monitor was connected to the DVR to display a multi-camera view of all cameras. 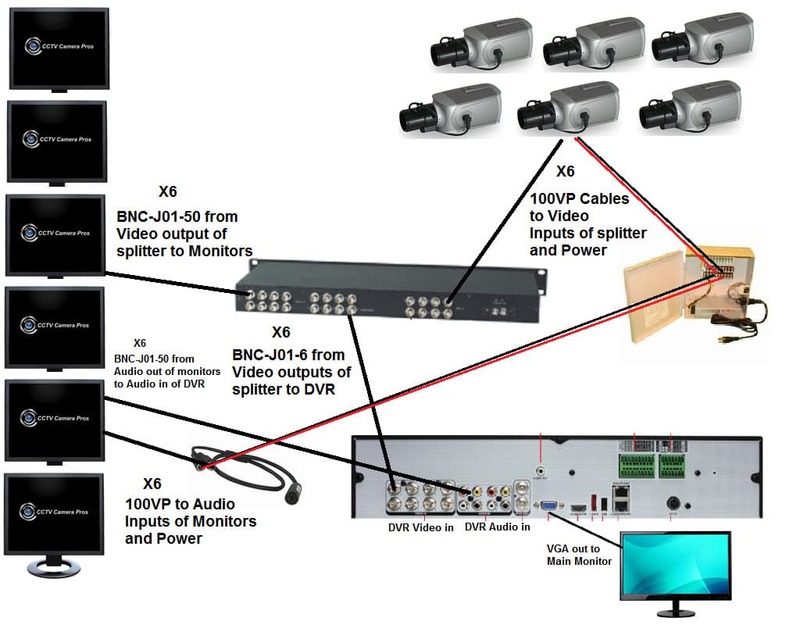 The audio output from the dedicated monitors was split and fed to both the DVR audio inputs and wall plate mounted jacks to to accept headphone connections. 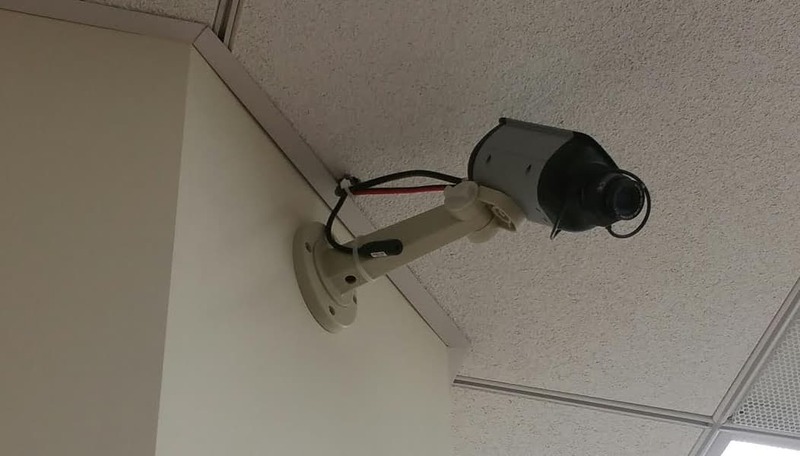 Here is a picture of the CCTV camera mounted with an audio surveillance microphone. In this case, the installer used zip ties to mount the mic to the mount of the camera. However, because these microphones are stand-alone (they use their own audio and power cable), they could be mounted anywhere in the room – not necessarily close to the camera. Although not used in this project, another option to capture both audio and video surveillance is to use a security camera that has a built-in microphone. These motion detector cameras have a microphone and are available in analog CCTV and high definition models (1080p AHD, HD-TVI, HD-SDI). Camera Pros partnered with Mercury Tech Partners to perform the installation at Kaplan University. Ron Hensley, Senior Project Manager and his team did a great job with the installation and even accommodated an additional request from the customer on the fly. Thank you to Kaplan University for the opportunity to work on this great project. Please contact chris@cctvcamerapros.net for any questions related to this project.